To people who love Ghost Recon this franchise doesn’t really need any introduction, Tom Clancy’s Ghost Recon series was one of the first shooters that got immensely popular and since then its fanbase follows it religiously from title to title. I myself enjoyed the Ghost Series; it has always been futuristic yet hyper realistic compared to other shooters, and that setting feels the most entertaining. 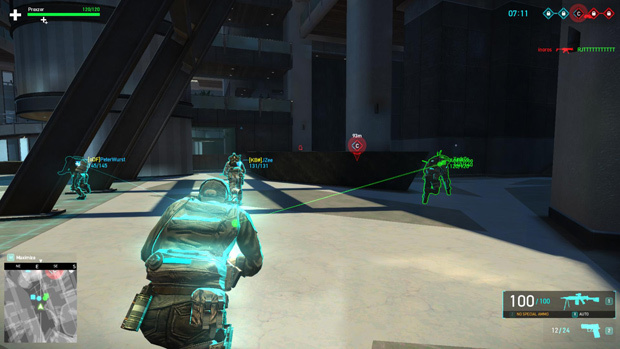 Since August of last year, Tom Clancy’s Ghost Recon Online opened this realm of shooters to the masses as an online multiplayer free action shooter. With plenty of time to smooth out bugs and up the total content, we figured it was time to give the game a fresh look. Before you head into the game you are able to pick between three available classes. Each one of these classes has their own tactical style and team objectives in the game. Luckily you’re never locked into playing just one and can dabble between the classes if you want to spice up your gameplay and mix things around. The three available classes are the Assault that is equipped with an assault rifle, a Recon that likes to shoot things from a distance with a sniper rifle, and the Specialist that can be seen as a support type of class that carries a light machine gun. Like I have said, each one of these classes have their own required play style, and you definitely need to have each one of these classes in your squad or else you will have a bad time, but more on that later. Online arena titles like GRO entirely focus on the use of game rooms to find your games and play around. Unfortunately I quickly experienced the nightmare that is called matchmaking in Ghost Recon Online. Matchmaking automatically sets you up with other people to play a game mode. Unfortunately GRO’s matchmaking fell short of my expectations from other shooters. Normally, I’d like to choose what I play and where I play. I want to decide what server I want to join, and how many people it includes. 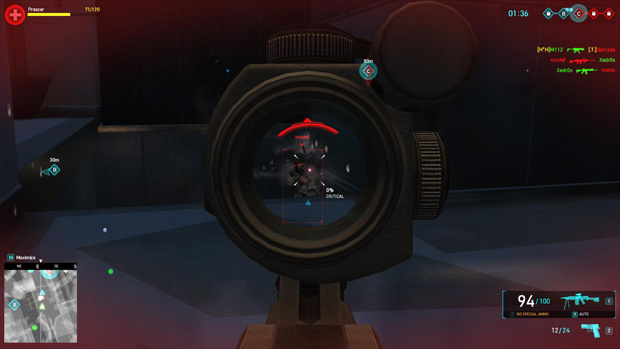 But choice is rather limited in Ghost Recon Online, and the population isn’t large enough to give matchmaking much flexibility. I would love to have a server browser and see the different playable game modes, but instead my only choice was the level range I wanted to play in. After that, you just hit the play button and hope for the best. Several minutes later (sometimes longer as I was queuing from EU and at odd hours for the majority of players), a match would pop. On the bright side, matches can rage on for quite a while, usually around half an hour in competitive battles. But if your team is getting massacred, you’re forced to endure it as leaving prematurely as it hurts your rank and lowers your reputation, making your matchmaking chore worse for future matches. All in all, I would’ve loved to see a different way to join games, and I think this is a primary cause of scaring off new players and keeping the population low. Besides that the interface, the menus, and the whole lobby system itself is beautifully done but in a shooter it all really comes down to how crisp and balanced the gameplay itself is. GRO forces you to take things slowly. Patience is a virtue, and luckily you’ll have built up plenty of it waiting out the queue. Run and gun gamers who think they can be godlike running wildly through the streets will be dropped in a hot flash and typically give away the rest of their team’s position in the process. 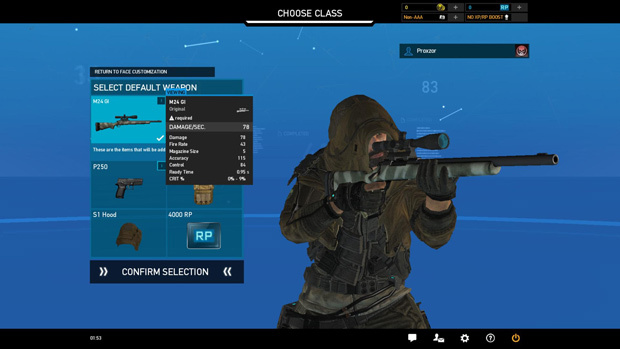 Ghost Recon Online follow suite with its Buy to Play counterparts, encouraging sneaking, camping, and teamwork. Currently the most played game mode is conquest. Just like in any other game with the game mode conquest, you will have several capture points on the map to battle over with your allies. But remember, the game is played at a slow pace and thus capturing these points isn’t as easy as charging in and standing around in the open waiting on a timer. Since a lot of people camp, often lying in wait at a capture point for ten plus minutes, you will have to scout areas and force enemies out before having a chance to capture them. With the use of class skills like cloak or weapon jams you can try to force your enemy to fall back. Brute force doesn’t work well without the powerful class skills supporting them. One thing I learned quickly is that this game is absolutely not balanced at all, which makes it even harder in a way. Some weapons deal a ton of damage, while others certainly don’t and if you have one of the beginner weapons equipped, well good luck trying to win the game. It is obvious that when you buy weapons they improve your performance, but new pups are often forced into the playground of the big dogs due to population limitations, resulting in some devastating losses. Ghost Recon Online is a lot of fun. I myself enjoyed playing it but there are enough hindrances for new players that I didn’t often feel encouraged to queue up for multiple matches in a row. Since the game isn’t that popular, new players should go in with the mindset that they’re going to get crushed quite a few times while slowly building up their character to hang with the veterans. Once you have bit the bullet and climbed the learning curve, with days of battle hardening matches under your belt, you will start to find yourself actually impacting the outcome of matches. This felt tedious at times as I rarely got to experience match modes outside of conquest. 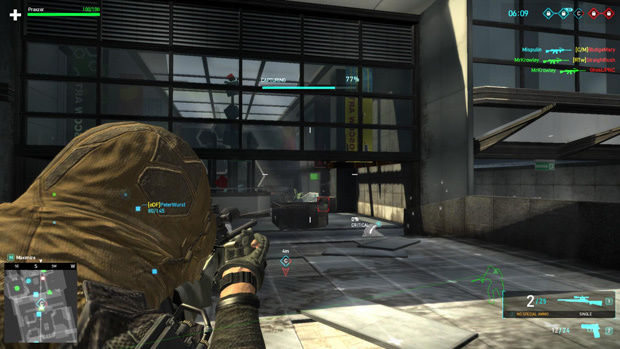 A shooter needs fast queue quick matches like Team Deathmatch to draw in a decent population by capturing the casual crowd. Perhaps I ask too much out of a Ghost Recon game, especially since the game supports camping with its many different stances and weapon possibilities, but sometimes the game was just too slow overall. Super Evil Megacorp is announcing several key news pieces that will help take the game and mobile esports to the next level.